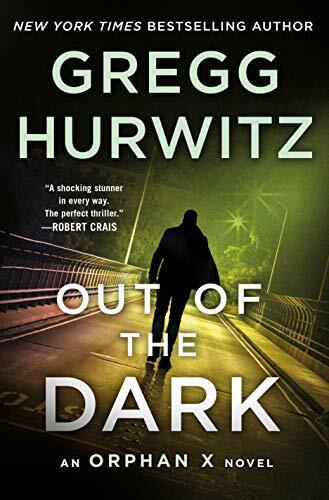 Coming up: a review of Gregg Hurwitz’s Out of the Dark. January 25, Deadline.com: EXCLUSIVE: Gregg Hurwitz, author of the best-selling Orphan X series, has inked what’s described as a “significant seven-figure deal” with publisher Minotaur Books for the next three volumes in the series. The next book in the series, Out of the Dark: The Return of Orphan X, hits shelves on Tuesday, Jan. 29. Dave Lull just sent me the above item, and it pleases me no end, because there can’t be enough Orphan X books for me. No doubt the TV series will ruin the concept, but keep the books coming, Gregg. Wetzel had read somewhere that Hollywood directors liked to hose down streets to make the asphalt sparkle on film. Washington was like that naturally, a black-ice kind of town—lose your focus and you’d slip and break your neck. Any review of the Orphan X books requires a little orientation lecture, but that’s OK, because it’s fun to tell. Evan Smoak is “Orphan X.” As a boy, he was “recruited” from a group home into the super-secret, ultra-deniable US government “Orphan” program. Under this program, smart, athletic kids whom no one would miss were trained to be the world’s most dangerous assassins and covert operatives. But gradually, under the direction of a bureaucrat named Jonathan Bennett, the program lost its focus and become badly corrupted. Jack managed to break free and, subsidized by income streams he can still tap (I never quite followed how that works), he now lives in secret in Los Angeles. His home is a luxury apartment, impenetrably secure, and from it he operates as “The Nowhere Man.” He’s a sort of a hero on call. People he helps refer him to other people who need a hero. One case at a time, Evan attempts to do penance for the sins of his earlier life. He has one major existential challenge – Jonathan Bennett is now the president of the United States. And for several years he has been systematically been killing off the few surviving Orphans. But of all the Orphans, Evan Smoak is the one he is most determined to eliminate – though Evan has no idea why. In Out of the Dark, Evan is busy planning the assassination of the president. A challenge, but he thinks he can carry it off. On top of that, he needs to save an autistic young man who, simply because of his naïve honesty, is targeted for murder – along with his whole family – by one of the most dangerous drug lords in the world. All the usual pleasures of a great thriller are present in Out of the Dark – rising suspense, heart-pounding danger, lots of high-tech electronics and computer hacking. (Frankly I found some of the action scenes over the top, but I was happy to suspend disbelief.) But what sets the Orphan X books apart is the sharpness of the writing – great characters, crackling dialogue, moments of wit. As well as just good, well-crafted prose. It’s a pleasure to read Gregg Hurwitz. Highly recommended, with cautions for violence, adult themes, and mature language.